Warm days are calling to get on the bicycle and enjoy exploring Riga on the two wheels. Are you ready to hit the road? 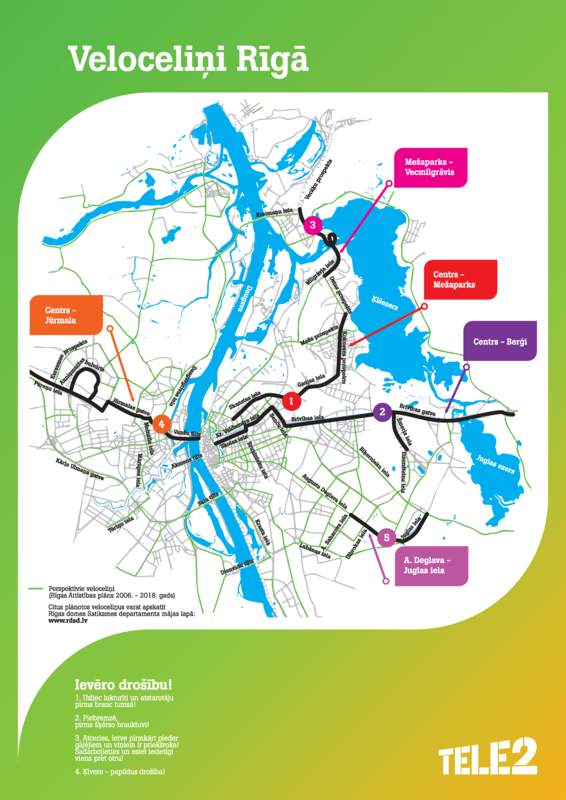 If yes, then check out the cycling map of Riga city, prepared by TELE2 Latvia, that will let you plan your trip along the safest cycle routes of Riga. The map is from 2011 but it is still very much accurate in terms of showing the main routes. This is will be also great for city residents and visitors of the capital to enjoy a green way of traveling around the town. Just remember one thing – in Riga cyclists are allowed to ride on the sidewalks, which is even recommended by the council an state. That can be very confusing and annoying for many of you who rode in London, Barcelona, New York, Amsterdam or Sydney, starting with getting run over by a cyclist or hitting a pedestrian while cycling yourself. This is happening due to cycling culture hasn’t evolved that much yet and people are simply not used to this way of traffic, but it is changing very fast and in next 10 years Riga will be a completely different place for cycling. Some of you might decide taking part in normal traffic with cars and buses, but to be honest it’s not that easy easy either, as car drivers are also not used to cyclists on the street, meaning they don’t care that much, making being part of normal traffic a bit dangerous activity in Riga too. Explore Riga and areas around, cycle alone of with friends and most importantly be safe on a road – a bit of extra attention is a must. Have a great time guys! There is also route along Daugava, from Vansu bridge to Salu bridge, and from Dienvidu bridge to the direction of Salaspils (currently is being built and prolonged).